Posted on Fri, Mar 16, 2012 : 6:02 a.m. Whether you live to spell or fear a world without spellcheck, local nonprofit writing and tutoring center 826michigan has the event for you: 826michigan’s Second Annual Spelling Bee for Honest Cheaters, Dirty Rotten Spellers, and Mustachioed Heroes. The bee will be held on Wednesday, March 21 at Woodruff’s Bar in Ypsilanti and will feature two-person teams of 826michigan staff and volunteers, University of Michigan professors, local businesspeople and area celebrities—all vying to out-spell and out-cheat the competition and take home the Almost Embarrassingly Large Trophy For First Place. Teams will raise money before the event, which may be used during the spelling bee to buy cheats such as “Ask the Audience” or “Try Again”. All proceeds, including ticket sales, support 826michigan’s wide variety of free creative writing programs for children age 6-18 in Washtenaw County. The Second Annual Spelling Bee for Honest Cheaters, Dirty Rotten Spellers, and Mustachioed Heroes will be hosted by Raymond McDaniel, poet and lecturer at the University of Michigan. In addition to three zany rounds of lightning-fast spelling, the event will feature a halftime show with segments such as the Dr. Seuss round, giving audience members a chance to spell on stage and face down words like “hop” and “pop” to win eternal respect and, very possibly, a silly hat. “We’re confident that this spelling bee will be unlike any other you may have seen,” says 826michigan executive director Amanda Uhle. “It’s going to be fast, fun, and a little bit crazy, and the only authority of the night will be the dictionary. 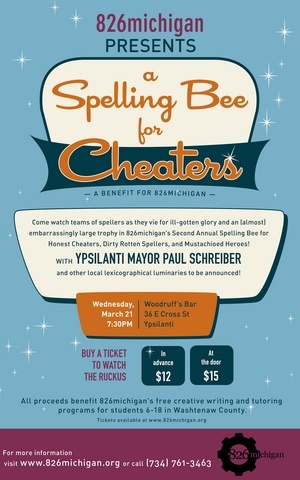 And of course, it’s a chance to indulge in some guilt-free cheating, since all the proceeds will be going to support 826michigan’s free youth education programs.” Spellers will compete in teams of two, raising money in the weeks before the event in order to cheat their way to the top. For more information on how to register as a team or become a business sponsor, call 734-761-3463 or email amanda@826michigan.org. Tickets to the Second Annual Spelling Bee for Honest Cheaters, Dirty Rotten Spellers, and Mustachioed Heroes will be available in advance for $12, or $15 on the night of. Proceeds will benefit nonprofit organization 826michigan. For more information about 826michigan and its free creative writing and tutoring programs for children 6-18 in Washtenaw County, please visit www.826michigan.org. Fri, Mar 16, 2012 : 7:27 p.m. This sounds like a blast--I would love to do this. Fri, Mar 16, 2012 : 12:13 p.m. This is the greatest fundraiser -- great cause, great people, great contest. Who doesn't like a little backup when your own brain can't figure it out?